I have been a Mopar enthusiasts all my life. My Dad back in the 50's used to trade for a new Mopar every 2 years for around $200. In 1969 I graduated from an Engineering College. A lot us purchased a new car upon graduation and Muscle Cars were flying off dealer lots. I saw a bright blue '69 Roadrunner, 383, white interior and Hurst 4 speed. I test drove it and had to have it. I paid around $2500 for it and the wife didn't drive at all. We have had Mopars for the last 30 consecutive years. Fast forward to around 2007 sitting in my Dentist waiting room reading I believe Car & Driver magazine. In there is a picture and article on the updated Challenger coming from Dodge. I was in love and some day I thought I would have one. In 2012 after coming back from vacation we talked about buying a new car. I had to retire a year before because of medical issues. I had been driving Chrysler's top end cars like the 300 for many years. And I thought I want something fun to drive again, like the Turbo Daytona I had in 1986. All of a sudden the Challenger came back to mind. Off to our local CDJ Dealer I went and I planned on trading the wife's Sebring Convertible that she loved. It was late in the '12 model year and they had one '12 Challenger left. A Tungsten SXT Plus. I made the mistake of getting in a hurry, not driving a Hemi and bought the car. I did get a good deal however. 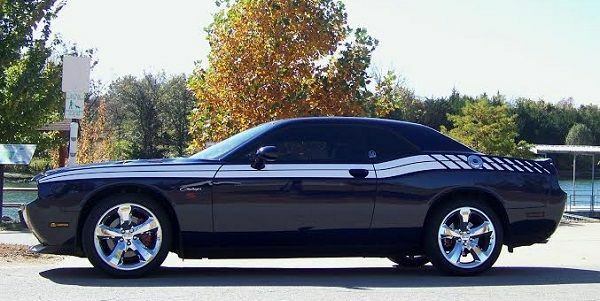 But then I got on a couple of Challenger Forums. I kept reading about the Hemi. One day back at the dealer to get my cracked rocker panels replaced they had a used R/T on the lot. You only go around once, I think I will see about taking it for a test drive. Bad move again. I was hooked. It was like driving the Roadrunner again except it was much more than just straight line busting your rear. It was an overall fun car to drive again. Retired I want to enjoy a Hemi. So 8 months after buying the '12 I traded in June for a '13 R/T Plus Jazz Blue, auto and sunroof. It was great for 3000 miles. I loved the car. Then around the end of September I took it in for an oil change. Shortly thereafter the engine starting making a racket on startup and idle. It stopped the idle noise but progressed to making a loud metallic clicking sound from 1800-2200 RPMs. It was most annoying hearing this sound over the radio inside of the car. It was ruining my enjoyment of the car. Something had to be done. I went to 2 different dealers with it. The first dealer never claimed to hear it. "Sounds normal to us," they said. The last said it was not the normal Hemi Tick. Hmm. Reading on the forums many talked about trying different brands of oil. So I tried that and no improvement.The dealer then recommended changing all the lifters. I was leery about opening up the engine but we needed to try. I can't stand the noise. Well that didn't help and I had a very strong burning oil smell inside of the car. The smell wouldn't go away and I was burning a lot of oil also. No leak could ever be found. It was about this time the recall was issued for the timing chain problem on prior years. One of the forums posted Mr. Pietro Gorlier, at the time Senior Vice President of Mopar Brand Service, Parts and Customer Care at FCA, email address. He wanted to hear about your timing chain problem. I thought I need help with this noise issue and others were having, I think I will email him. What can it hurt, right. I sent the email and complimented him on resolving the timing chain problem to the satisfaction of other Challenger owners. I then explained my purchasing loyalty to Chrysler and said I have a problem with my Challenger. Can you help me. The very next day I received a phone call from a Customer Care rep. Over the next 2-3 weeks of phone conversations and dealer input Chrysler made me 2 very generous offers. We will replace the engine or the car at no cost to you. On 4/25/14 I took possession of a brand new '14 Jazz Blue Challenger R/T Plus. I now have over 10,000 miles and no issues of any kind. I love the car, again!! Unfortunately many other customers have the annoying Hemi ticking issues and are not getting any satisfactory help. Why, I don't know. Maybe someone from Chrysler will read this and get involved. Please! And the wife now drives a '15 Charger. Mopar or No Car! 2014 Jeep Cherokee problems and recalls please. 01Dodge Durango Sport 4x4 4.7L worst engine made by Dodge, 170K miles.Vlv seats problems like common problem,vlv seats have to be wedged when pressed into heads,2 dissimilar metals 2 diff heat expasion points and 195°f t_stat should be down to 180°f $500 to recondition auluminum heads new vlv seats pressed in and wedged into heads to prevent from pop pin out of head by using a punch every 90° around vlv seats,Dodge should have had a recall on this 4.7L engines.Never by a dodge again for me,old school dodge i like but not new school even the new hemis having head problems. Asta la Vista Dodge..